The 150th anniversary of the Civil War is a momentous occasion and we are still recreating battle scenes to commemorate this period of our nation’s history. 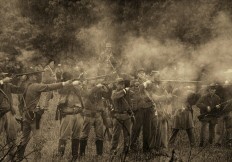 If you have ever thought about being a part of the reenactment community, now is the time to come join us in paying tribute to the courage of our Civil War forefathers. I am a member of the 3rd Arkansas Volunteer Infantry. The unit we portray was the only Arkansas infantry regiment that fought with Robert E. Lee’s Army of Northern Virginia from August, 1862, to the surrender at Appomattox. The 3rd Arkansas joined the Texas Brigade just after the Battle of Sharpsburg (Antietam) and just before the Battle of Fredericksburg. This unit was a hard fighting unit with a lot of pride and would be classified as Shock Troops in today’s military jargon. We are always looking for good men to join our Band of Brothers and experience the camaraderie of our unit. We have participated in several of the large, national events like Gettysburg, Shiloh and Antietam. View our galleries for photos from those events. Our headquarters is in southwest Arkansas. If your location is a long distance from this area, we can help you find a local Civil War reenacting unit. Contact Vernon Dutton today to get started.